This Grilled Tangy Chicken has such a delicious punch of flavor and the marinade is loaded with yummy ingredients. It is perfect for busy days or when you want dinner in a hurry. It is a summertime staple at our home. Life has been sooooo crazy lately, but the good kind of crazy (at least some parts haha!). First off so sorry for being MIA. My baby turns 6 weeks tomorrow and while life has been so fun and great I had to go in for a minor post-baby-procedure earlier this week. All is well now and actually I am feeling so much better since having it. Aside from my post-baby-issues, life has been so fun. We have also been in the hustle and bustle of school, dance and soccer and I am doing my best to keep up with all my kids and their fun day-to-day activities. I am so glad to be back and in the full swing of things. With all the craziness of my life lately, I have needed quick and easy dinners. 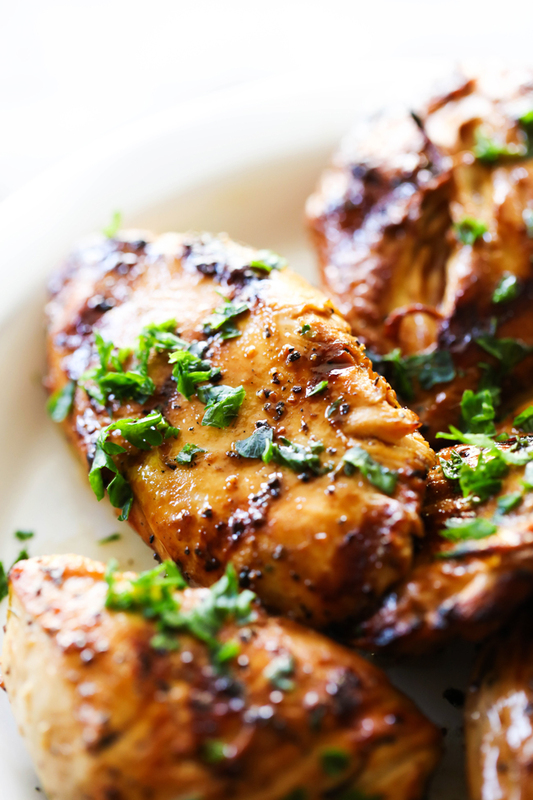 I love marinades because I make them the night before and all I have to do is throw it on the grill the next day. This meal was so delicious and didn’t shy on flavor. It is packed with tasty ingredients that fuse together for such an great recipe. If your life is busy, hectic or if you are simply looking for a quick and easy meal idea, this is a great recipe for you! Combine all ingredients in a large glass dish. Grill on low and until chicken is cooked through, turning the chicken over half way through. Chicken breasts and this marinade promise to have easy and tasteful week day dinner both for my son and me. Thank you so much !